If you have a home with a crawl space or you are building one, there are several options on what to do with that particular foundation type to handle air movement. Most crawl spaces are vented to the outdoors, however, in more recent times, encapsulating the crawl space has gained recognition as the best way to eliminate moisture problems that often result from venting crawl spaces. But what do you do about the air down there if you choose to encapsulate? Continuously operated mechanical exhaust ventilation at a rate equal to 1.0 cfm for each 50 ft² of crawlspace floor area, including an air pathway to the common area. Conditioned air supply sized to deliver at a rate equal to 1.0 cfm for each 50 ft² of under-floor area including a return air pathway to the common area. Let’s take a look at each of these methods. Based on the code requirements, a 1500 square foot home with the same size crawl space would need a 30 cfm exhaust fan. This fan would be mounted in the foundation wall and would continuously pull a small amount of air from the crawl space to the outdoors. To account for makeup air, the code specifies transfer grills be installed in the living space floor to provide a pathway for air to move into the otherwise sealed crawl space from inside the home. The code does not specify details about the fans or transfer grills that are to be used in encapsulated crawlspaces. Some states have provided amendments to the IRC to assist in this regard. For example, Colorado requires a fan rated for five years of continuous operation and connections designed to reduce vibration and noise associated with the fan. These fans are affordable and readily available in the general market. The fan must be connected to a trouble light or alarm to signal occupants when the fan fails. For makeup air, Colorado amendments recommend transfer-air openings, one per 250 sf of crawlspace floor area, installed in the floor between the crawlspace and conditioned rooms above. Based on the code requirements, a 1500 square foot home with the same size crawl space would need 30 cfm of supplied air from the HVAC system to be delivered to the crawl space. 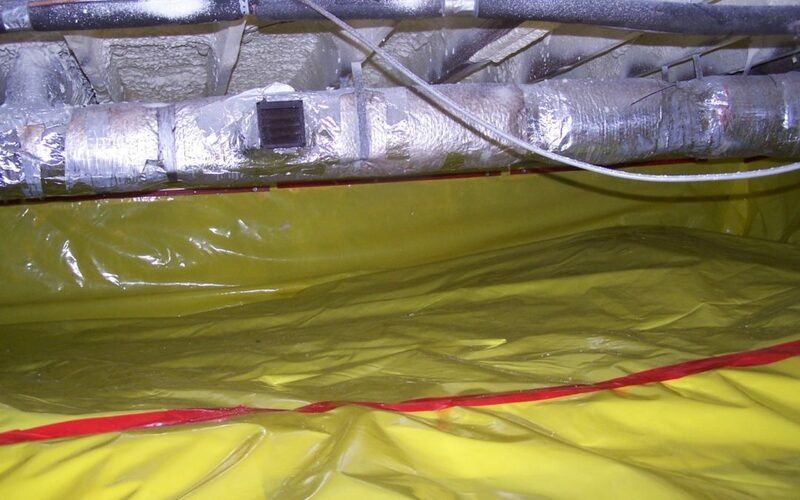 In most homes, there is already a duct system in the crawl space, so this is relatively easy and inexpensive to do. A small hole is cut in the HVAC trunk line and a dampered register is mounted over it. Again, to account for makeup air, the code specifies transfer grills be installed in the living space floor to provide a pathway for return air to move back into the home from the crawl space. What were they thinking when they wrote these requirements?? Clearly building science considerations were not part of the decision making process! These methods call for conditioning the crawl space based on the conditions of the finished living space above. Unfortunately, the crawl space has its own conditions, which may or may not respond well to controls located in a different situation. For example, these methods might work well in summer during cooling days if the air conditioner is sized properly. If the system runs long enough, it can provide enough dry air to the crawl space to keep the relative humidity below 70%, which is where you want it to be in order to prevent moisture problems. In the spring and fall swing seasons and in homes with oversized air conditioners (which is a very common occurrence), these methods may not work and elevated moisture levels may develop in the crawl space as a result. Controlling humidity in the crawl space is the very basis of crawl space encapsulation design. When humidity levels are allowed to exceed 70%, mold growth can accelerate, condensation can occur, wood framing can rot, and if the crawl space is connected to the living space through open transfer grills, these problems and their associated bad odors can extend into the home. 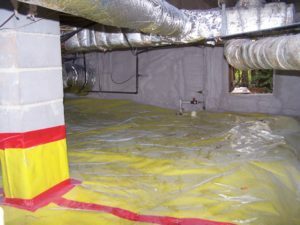 So what can you really do to properly handle encapsulated crawl space air? Simply adding a little bit of air from the HVAC system is the most common method used in the industry. This method puts the crawl space under a slight positive pressure and the house under a slight negative pressure. Most HVAC professionals would view this as a problem because their design goal is to maintain an overall pressure balance for the conditioned area. However, in reality, the small amount of airflow delivered to the crawl space via this method causes a negligible pressure effect that is far exceeded by the effects of duct leakage, stack pressure and wind-induced pressures in the building. This has been demonstrated in various field tests, including those conducted by Advanced Energy (See ‘Advanced Energy-Closed Crawl Spaces Guide’). How can this method be used to satisfy code requirements? Often, code officials are as confused about these requirements as we are. Many code officials are willing to accept this approach with the caveat that a passive exhaust valve with flappers also be installed in the crawl space wall, to exhaust crawl space air if the area becomes pressurized. This simple device can counterbalance the slight positive pressure exerted by the HVAC supply and bring the overall crawl space pressure balance to near equilibrium. It is also advisable to monitor crawl space humidity levels with a remote sensor to ensure that excessive moisture conditions are not allowed to develop. If this does occur, the addition of a dehumidifier is recommended. A dehumidifier alone, however, will not satisfy code. Contact Green River LLC today for a free inspection of your crawlspace and an estimate for encapsulation!